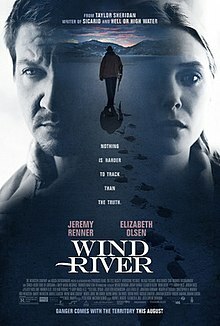 ^ Wind River. Sundance Film Festival. [2017-01-04]. ^ Fleming, Jr., Mike. Sundance 2017: $6 Mill Grateful Dead Docu Deal? Will Streaming Services Drive Deal Avalanche?. Deadline. 2017-01-19 [2017-01-24]. ^ Wind River (2017). The Numbers. [2017-09-18]. ^ 5.0 5.1 Patten, Dominic. Sundance 2017: Robert Redford, New Rashida Jones Netflix Series, ‘Rebel In The Rye’ & More On Premiere, Docu, Midnight & Kids Slates. Deadline.com. 2016-12-05. ^ 6.0 6.1 6.2 6.3 Jeremy Renner & Elizabeth Olsen To Star In ‘Wind River’ Pic From ‘Sicario’ Scribe And Thunder Road. Deadline.com. 2016-01-15 [2017-07-02]. ^ 7.0 7.1 Goodfellow, Melanie. Wild Bunch's Insiders launches Olsen, Pine film 'Wind River'. Screen Daily（英语：Screen Daily）. 2015-05-14 [2017-01-19]. ^ 8.0 8.1 8.2 8.3 8.4 ‘Wind River’ Adds Jon Bernthal & Others As Shooting Starts On Jeremy Renner Thriller. Deadline.com. 2016-03-31 [2017-07-02]. ^ 9.0 9.1 Kelsey Asbille Sails To Thriller ‘Wind River’ With Jeremy Renner & Elizabeth Olsen. Deadline.com. 2016-04-25 [2017-07-02]. ^ Nick Cave & Warren Ellis Scoring Taylor Sheridan's 'Wind River'. FilmMusicReporter. 2017-01-18 [2017-01-19]. ^ Fleming Jr., Mike. Weinstein Name Stripped From ‘Wind River’; Tunica-Biloxi Tribe Financiers To Pay For Oscar Campaign. Deadline.com. 2017-10-25 [2017-10-25]. ^ Gleiberman, Owen. Sundance Film Review: ‘Wind River’. Variety. 2017-01-22. ^ Wind River is a thrilling, violent finale to the Hell or High Water and Sicario trilogy. The Verge. 2017-01-23. ^ Wind River (2017). Rotten Tomatoes. ^ Wind River reviews. Metacritic. [June 11, 2017]. ^ ‘Wind River’ Review: Jeremy Renner Is An Ice-Cold Cowboy In Taylor Sheridan’s Solid Noir — Sundance 2017. IndieWire（英语：IndieWire）. 2017-01-23. ^ Lodge, Guy. ‘A Man of Integrity,’ ‘Wind River,’ ‘Barbara’ Take Un Certain Regard Awards at Cannes. Variety. 2017-05-27 [2017-05-27].